How much calf & heel clearance do PDG’s no & low-kneerise chairs (Bentley, Fuze T20, and Stellar) offer for foot propelling? Bentley – The Bentley is frequently used by individuals who foot propel since the chair maintains constant knee height while tilting. The lower part of the gas strut mounting bracket is located 7” rearward from the front edge of the seat pan and 5” above the floor, leaving enough space for the user’s lower extremities to allow for foot propelling. 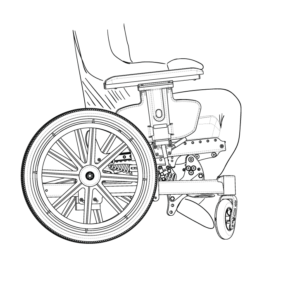 The user’s lower leg can easily angle back in the range of 35° beyond 90° without hitting any part of the wheelchair frame. Fuze T20 – The crossbar of the Fuze T20 is located approximately 4” rearward from the front edge of the seat pan and about 8-1/2” above the floor. The user can angle back their lower leg approximately 30° degrees beyond 90° before coming into contact with the crossbar at a point several inches above the user’s ankle. Stellar – The Stellar can be used by individuals who foot propel as long as the chair is not tilted beyond approximately 25°. Normally, the Bentley or Fuze T20 would be preferable, but some individuals need more tilt, so the Stellar is used. The lower part of the strut mounting bracket is located 4” rearward from the front edge of the seat pan and 6” above the floor. Because the lower part of the bracket is closer to the floor, it will potentially come into contact with the person’s heel as their lower leg angles back in the range of 20° beyond 90°.